FREE IMPROVISATION has long intrigued me; partly for the certain discovery of the unexpected and unknown, but also for its ability to divide opinion – to maybe startle or even perplex. For the uninitiated, there can be an element of ‘king’s new clothes’ as established musicians ‘nakedly’ create random and often dissonant sounds between them. Yet, deep down, there can be the reward of hitherto unheard textures and sequences to inspire our own thought and imagery. Released on 15 March 2019 and available at Bandcamp in CD and digital formats. HOW IS IT that spontaneous, wholly improvised music can find a fascinating, sometimes emotional connection between its creators and the listening ear? In the case of guitarist/pianist Charlie Beresford and cellist Sonia Hammond, apart from their previous releases (The Science of Snow and The Lightning Bell), there is little preconception of the specific timbres they come together to generate for each new recording. No musical form or structure, no recognisable theme nor tried-and-tested formulae, and only occasional clues from their titles. But yet again, with latest release Each Edge of the Field, their assured presentation of abstractness draws heart and mind into the landscapes they inhabit. Indeed, there is something instinctively interactive and responsive about these raw, acoustic and often filmic expressions, their space allowing you to become involved, to visualise imagery, to feel like you’re participating. 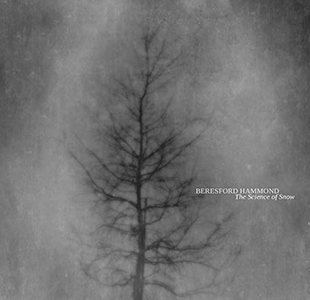 As before, Beresford and Hammond seem to draw inspiration from the rural beauty and climatic capriciousness of their Welsh home patch around both Kington and Knighton, Powys; and their nine tracks here display percussive torment, lyrical fragility, but also a characteristically bohemian warmth. Heralded by school bell and field recordings of raven calls, Calling the Corvids‘ stark, brooding darkness is formed by sustained, billowing piano clouds and searing cello harmonics, with a palpable sense of evolving exploration between these two, creatively open minds. Given Sonia Hammond’s strong involvement with the classical repertoire, there’s no denying that her approach can evoke the British cello concertos of, say, Elgar or Moeran (both of whom are associated with this general locality), and such intensity is evident in both At the Moment it Broke and the title track. The duo’s ability to summon unusual textures from their three instruments is remarkable. A hurdy-gurdy-like prepared guitar vividly pictorialises Wire Fence, full of repetitive, scratchy motion which somehow imagines a Philip Glass-scored movie thriller; and Campanulae‘s calmer but thinly-veiled tension unsettles with rattling, discordant chimes. Motorised arco guitar in Vyallt becomes so closely intertwined with chattering cello that distinctions are unclear, save for Beresford’s elegant, solo-line improvisations; and their screeching, nails-on-blackboard harmonics grab the attention at high volume. A medieval naivety permeates the chordal guitar elements of The Weathering Yard as it clashes with contemporary classical themes – double-stopped cello marcati here are a joy, as is the intuitive, contrapuntal invention of both players. Hammond’s prepared instrument in jarring Oracle of Strangeness combines with Beresford’s inner-piano percussiveness to alarming effect; and completing the circle, as well as perhaps pointing the way to future collaborations, Crow‘s melodic guitar delicacy connects high cello harmonics and hollow depths back out into the sylvan surroundings. Each Edge of the Field requires a certain quiet solitude to appreciate and three-dimensionalise its fluctuating nuances of sound and restraint. But you’ll know when you’re ‘in’. Released on 1 July 2017 and available as digital download or limited edition CD from Bandcamp. ARISING from a 2015 Aldeburgh Music residency, keyboardist Kit Downes and tenor saxophonist Tom Challenger conceived this imaginative project under the title Vyamanikal (from an ancient Sanskrit term for ‘flying machines’ – Vaimānika Shāstra). Seven improvisations, recorded across five Suffolk churches*, take advantage of pipe organs and converted harmoniums in widely differing acoustic environments. Some instruments are in a creatively intriguing state of disrepair, whilst others – such as Framlingham’s historic, opulently-decorated 17th Century Thamar organ – are presumably more likely to be heard sounding the triumphant strains of J B Dykes or Samuel Wesley. As a church organist of many years, I declare a specific interest in the instrument’s myriad capabilities. But here, like some musical ‘horse whisperer’, Kit Downes discovers and teases out perhaps hitherto undiscovered hoots, wheezes and subterranean reverberations which are accordantly combined with tenor saxophone ‘plainsong’ and distant, natural bird calls (close to Suffolk’s wetlands). The duo recently took their project to St Ann’s Church, Manchester, backed by continuous video projections of various hard and soft landscapes. Late at night, with Downes arched across four manuals and pedal board, the deep, 32′ acoustic bass frequencies remarkably shook and rattled the very back corridors and galleries of the 18th Century architecture; and Challenger’s dry, often hollow tenor echoed around the elegant, white-columned ceiling spaces, melding sympathetically with the windy or intense strains of Downes’ own improvisations. Rural village church quietness is discernible in Apicha as chattering birdsong and variably-opened, train-whistle-like drawstops are underpinned by sustained chordal clusters, whilst tentative tenor melodies drift around; and Bdhak‘s repetitive engine-room bleeps and modulations provide an otherworldly canvas for Tom Challenger to roam (shades of Garbarek, but with loftier freedom). Tremulant, hurdy-gurdy-like Sa becomes extraordinarily industrial, Tromba stops blustering with incredible density (far removed from any hymnary) before floating heavenwards with harmonic tenor beauty; and moorhen cheeps and cawing ravens enhance the breathy textures of Vistri in a soundtrack for windswept wheat fields and marshlands. The flapping organ resonances and tenor sax melancholy of one of the album’s longer movements, Jyotir, might suggest desolate, chilled panoramas as an impressive, sustained swell rises symphonically to imply the glorious warmth of sunrise… eventually returning to afterglow birdcall mimicry. Also suggesting midwinter solitude, Maar-ikar‘s de-tuned, fading registrations ebb and flow to a background of tweets and gravel-path treads (an organ solo, unless Challenger’s timbres are perfectly integrated); and Nya-aya‘s subtle, dark-sky drone closes the sequence with a peculiar sense of anticipation and apprehension. Vyamanikal is available from Bandcamp. Watch Aldeburgh Music’s video about the project. THE IMPROVISATORY MUSIC of guitarist/pianist Charlie Beresford and cellist Sonia Hammond, in 2014 album The Science of Snow, came as something of a revelation. Arising quite simply from a cancelled studio booking, the duo proceeded to use the time to create an enticing, spontaneous sequence of artistic impressions which had the ability to conjure visual imagery in a spacial and often affecting way. For new release The Lightning Bell, Beresford and Hammond collaborate with classical, prog rock and improv pianist Carolyn Hume; and singer Judie Tzuke guests on two tracks, complementing Charlie Beresford’s own vocal contributions (Tzuke’s 1979 chart hit Stay With Me Till Dawn remains a spine tingler). Once again, this is original music which somehow transports mind and soul to another place, where the freedoms of improvisation are able to connect with the emotions so surprisingly. On the surface, these abstract soundscapes could be perceived as dark, sombre spaces – yet beneath lies bohemian beauty resulting from a meeting of creative spirits at one moment in time. The title is derived from an 18th Century device which demonstrated, albeit simply, the conversion of an electrical charge into mechanical energy – the movement of a clapper between two oppositely-charged bells to create sound. The introduction of improvised, sung phrases into some of this album’s eight, expansive tracks brings a further instrumental dimension, rather than apparent, specific meaning. Beresford’s utterances in slowly drifting opener Call the Time add to a sultriness vaguely redolent of Gershwin’s Summertime, as he whispers across sustained cello, diminished piano elaborations and abstract guitar; and the addition of Judie Tzuke’s recognisable, mellow tones in Then the Cloud Comes contribute to a vivid, overcast landscape, with Hammond’s cello scratching the sky and Beresford’s persistent, wiry guitar tremblings accentuating Hume’s rainy piano. As with the first release, the music here is often on a filmic scale – Feather War Cast’s openness and unpredictability, across almost ten minutes, allows the imagination to run free; a combination of melodic, pitch-bent guitar extemporisations across sustained, English contemporary classical piano and cello, interspersed with extraneous knocks and scrapes. The Heavy Branch is particularly indicative of deep bell clangs and chimes as Hammond’s sinuous cello harmonics meld effectively with Beresford’s clever, echoic guitar purrs – and Carolyn Hume’s Debussyian piano depth (à la The Sunken Cathedral) emphasises its humidity. Fascinating, if a little disturbing, Laid Bare‘s darting guitar glissandi and slippery, whistling harmonic cello become clothed in delicate, skylit piano; and pastoral, melancholic As If All Was Within, with subtly chattering guitar strings on frets, is ornamented by the soft, folky words of Charlie Beresford. Judie Tzuke’s vocals provide In the Dark Hours with a more songlike feel, though its references to insomnia and nightmare bring a chill to the sparse instrumental weave; and The Last Port concludes – perhaps the darkest, most menacing film-score episode of the entire album. These are deep expressions, yet the imagery and emotion triggered by the sincerity of such artistic improvisation can make this a compelling experience. Take a listen – video: Call the Time. Released on 12 June 2016, The Lightning Bell is available from the52ndshop and Amazon. I’VE BEEN studying science. To be more precise, The Science of Snow…… a free improvisation release which, like some delicately efflorescent ice crystal, has securely grabbed and held my attention. “Free improvisation?”, you may ask. “Abstract self-indulgence?”, you might inquire. Well, the beauty of this experience entirely depends on both your musical standpoint and your aesthetic receptivity. Charlie Beresford is an acoustic guitarist, pianist and visual artist based in Radnorshire, in the Welsh Marches (twixt the Shropshire Hills in the North and the Brecon Beacons in the South). Classically-trained cellist Sonia Hammond, too, resides in this beautiful rural oasis – and both are founding members of the Radnor Improvisers. A cancelled studio booking led the musicians (already established in their respective musical careers) to maximise the opportunity by opening up an improvisational session; and what ensued was this spontaneous, imaginative blend of sound, drawing on contemporary classical, jazz and rustic folk. Those who have witnessed the charm of Knighton, Presteigne, Kington, Hergest Ridge and surrounding areas cannot fail to have been affected, either creatively or spiritually, by their unquestionable splendour (alluded to in this album’s evocative, ECM-like sleeve photography). And here, Beresford and Hammond appear to reflect their impressions of those landscapes, and the changing seasons’ effect on them, in this engaging 45-minute dialogue of highly unpredictable artistry. Winter is implied in the title track, as Beresford’s thinly-timbred guitar picking is tempered by Hammond’s sustained, Tavener-like cello phrases – a vivid pictorialisation of watercolour sunrise melting night’s icicle sculptures; and Marking the Hillside‘s hollow, gamelan-style chimes underpin searing, misty harmonics and fascinatingly abrasive strings and percussive slaps. The eight-minute panorama of Headless Bluebell may seem disquieting, yet the multicoloured hues of piano and cello (suggesting Glass, and even glimpses of Elgar’s later-life chamber works) summon images of the Borders’ mercurial climate, as if viewed from steep mountain tops. Snow Blindness possesses a frail beauty, its wide-openness easily conjuring the more melancholic character of Peter Warlock (The Curlew) or E J Moeran (the string quartets) – both of whom resided in these Welsh borderlands; and Beresford’s mellower, folksy guitar provides some warmth in an otherwise bleak soundscape. The dissonant undercurrent of Scratching the Sky, achieved through close, fluctuating cello and guitar intervals, is shot through with the Finzi-like intensity of Hammond’s attack, as well as muted prog-rock guitar ostinato. In contrast, searing heat is imagined in Gecko as Beresford’s Steve Reich-fashioned rhythms, amidst disembodied clatters, are impressively traversed by sinewy, writhing cello; and the relative cello serenity of Inside and Outside the Head is curiously threatened by persistent, percussive bows and scrapes from Beresford’s guitar. To close, The Path, the Bridge, and the Otherside might hint at folksong, as cantabile cello finds greater harmony with its captivatingly intricate guitar accompaniment. Free improvisation might well be perceived as challenging – but, once ‘inside’ this deeply-created music, and listened to as closely as possible, it can create a powerful, personal response. For me, the experiences of discovery in this album continue. The Science of Snow is available in CD and download formats at Bandcamp (videos to view here).